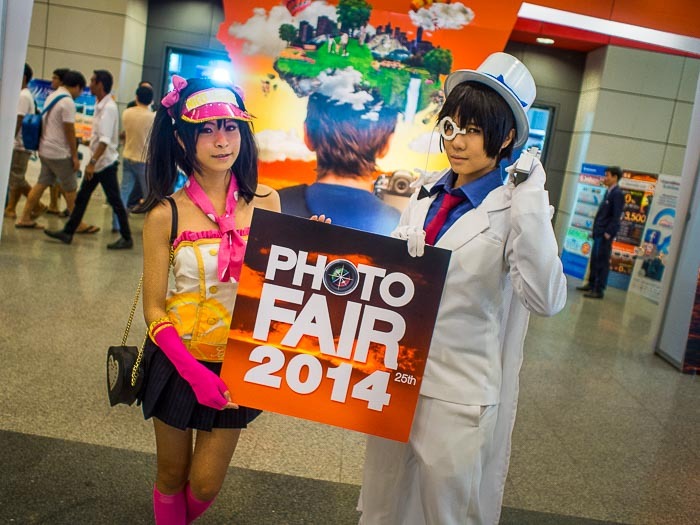 Welcome to the show my friend: the Photo Fair Thailand 2014. There is a thriving photo community in Thailand and Thailand has a long photographic tradition. Several members of the Thai Royal Family have been accomplished photographers. King Chulalongkorn the Great (Rama V) is credited as being the father of Thai photography. Bhumibol Adulyadej (Rama IX), the current King, always had a camera around his neck when he was traveling in Thailand and visiting his subjects. It was usually a Canon but he is also known to have Leica rangefinders. One of his daughters, Princess Maha Chakri Sirindhorn, is a very avid photographer who recently had a massive show at the Bangkok Arts and Culture Centre. 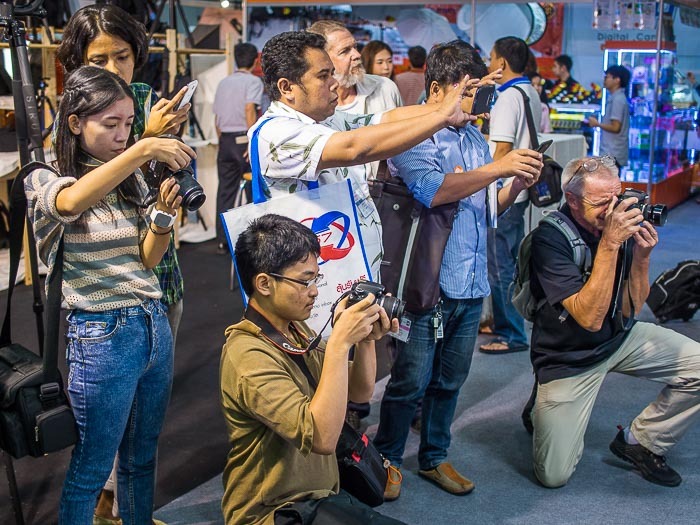 The annual Photo Fair Thailand is a large, very well attended, celebration of all things photographic. I went to check out what the manufacturers had and look at the exhibits. Photographers using everything from smart phones to "real" cameras to photograph spokesmodels in a booth at the Photo Fair. Most of the manufacturers had spokesmodels hawking their latest gadgets. They were photographing these "spokesmodels" who were selling some kind of a camera holster thing. Seriously. The big difference between the Photo Fair in Thailand and similar events in the US was the total absence of computers and software here. I didn't see one booth selling computers or software, I also didn't see anyone selling enlargers or darkroom supplies. This show was definitely focused on moving camera equipment. Canon and Nikon had huge booths where people could try all of their latest offerings, from small point and shoots (which have been almost totally eclipsed by iPhones) to super telephoto lenses and the latest dSLR bodies. Their booths were crowded but not jammed. Sony was busy showing off their latest mirrorless offerings. People seemed genuinely interested in the Sony A7 bodies. Olympus had a good sized booth busy showing off their Micro 4:3 line of cameras and lenses. But the most crowded booth was easily the Fuji booth. There was a constant line of people waiting to handle the Fuji cameras. With just 16 stations to handle merchandise, it was also the smallest booth. I think this was smart planning by Fuji. It definitely created a buzz around their booth that Canon and Nikon didn't have. 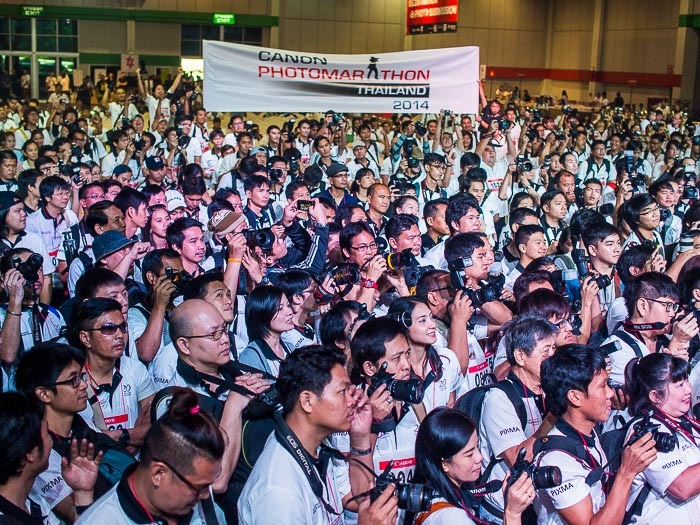 The crowd at the start of the Canon Photo Marathon. 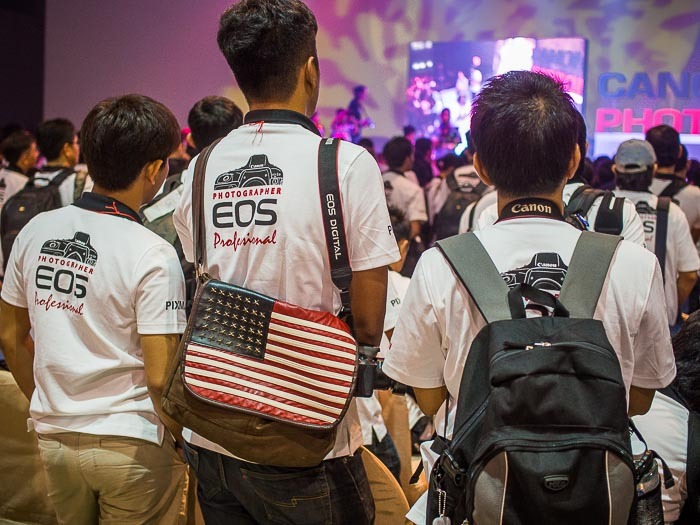 To be fair, Canon, in particular, seemed to save most of their marketing efforts for the Photo Marathon, a photo contest that drew thousands of participants (most using Canon cameras but that wasn't a requirement). On Saturday, during the Marathon, it seemed like half the people at the Fair were wearing Canon tee shirts. Canon "snappers" get ready to go on the great picture hunt. The Fair was interesting and, at least for me, validated my decision to stay with M4:3 cameras and Olympus. It was also a lot of fun wandering around watching other people photograph. I didn't photograph very much and I didn't put any of them in my archive or send them to agencies, (in two days at the fair I exposed about 90 frames - Wednesday at the Chinese opera for 2.5 hours I exposed about 400 frames ) but I had a good time. * With apologies to Rod Stewart and Ronny Wood.